I’ve still been trucking along on the Couch To 5k Plan! I can’t believe I’m on week 7 already! Today’s run jog was 2.5 miles in 25 minutes, no walking breaks. I wish I could say other wise, but it was hard. I wasn’t even going to do it today, because I was having hip pain, but decided to just try it out. Once I warmed up with some walking though, it started feeling better and didn’t hurt while I ran. That was good. I ran around my neighborhood and brought my phone’s timer so I could track how long I’d been going. The first 12 minutes I was going really fast and strong but the last half I was so dead. I kept jogging though. When I had only 3 minutes left I started sprinting. I always get a burst of energy at the end of my runs! I actually counted every single calorie that I ate today. I haven’t done that in a long time. I always eat so much better when I count calories. I hate it when people say to not count calories. I can see how it can become an obsession and unhealthy, but I think it is really helpful for some people. When I used to count calories, my goal was to eat as less as possible. Bad, bad, bad. I was obsessed and starved myself. But today when I was counting, my goal was to listen to my body and eat intuitively. 1/2 cup oats cooked in water with 1 cup frozen strawberries whisked in. 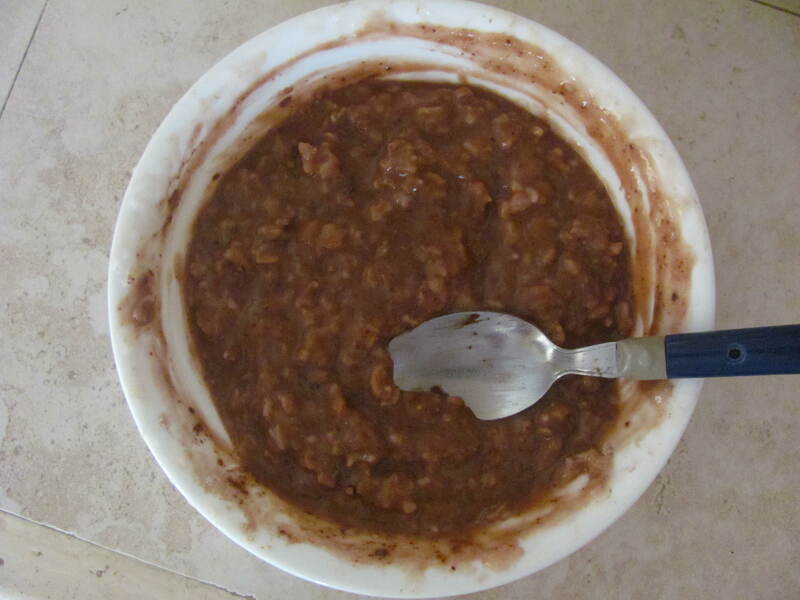 Soak overnight then in morning stir in 1/2 scoop chocolate protein powder and a few dashes of unsweetened cocoa powder. 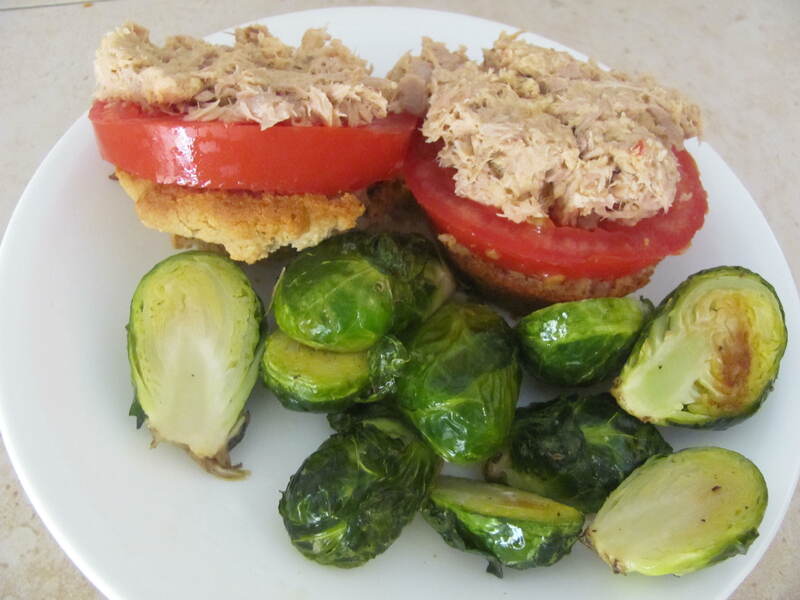 Roasted brussels sprouts (chopped in half, tossed in olive oil + salt/pepper; 400ºF – 15 minutes) and a oat flour muffin with hummus-tuna and tomato. I have an obsession with oat flour. If you haven’t noticed. When I visited Whole Foods for the first time, I saw a loaf of bread made with only oat flour, water and leavening agents. I didn’t end up buying it, but I couldn’t stop thinking about it. 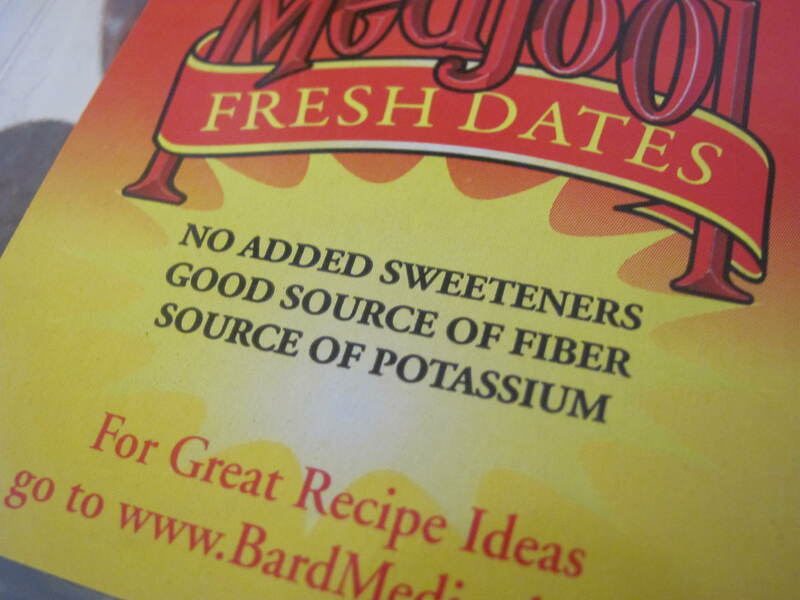 I’m going sugar free for the month, and needed some bread without added sugar! I wanted to try making a completely oat flour bread. I found a recipe online, tweaked it a bit and the muffins came out wonderful! I decided muffins are more fun than bread, anyway! I was actually really really worried about how these would turn out. The batter was such a thick and weird consistency, but they baked beautifully! The muffins have a wonderful texture and crumb, I omitted the added sugar yet they taste delicious! Pre heat oven to 350ºF and grease 9 muffin tins. Mix dry ingredients. Add milk, beaten egg and butter. Mix just until moistened, careful not to overmix. Spoon thick batter into muffin tins. Bake for 25 minutes. Remove from oven and let cool for 5 minutes. The muffins are delicious warm, but I found them even tastier after being cooled the next day! These muffins clock in at just 107 calories each and they taste amazing, I’m definitely in love! Who could have thought sugar free muffins could be so delicious? 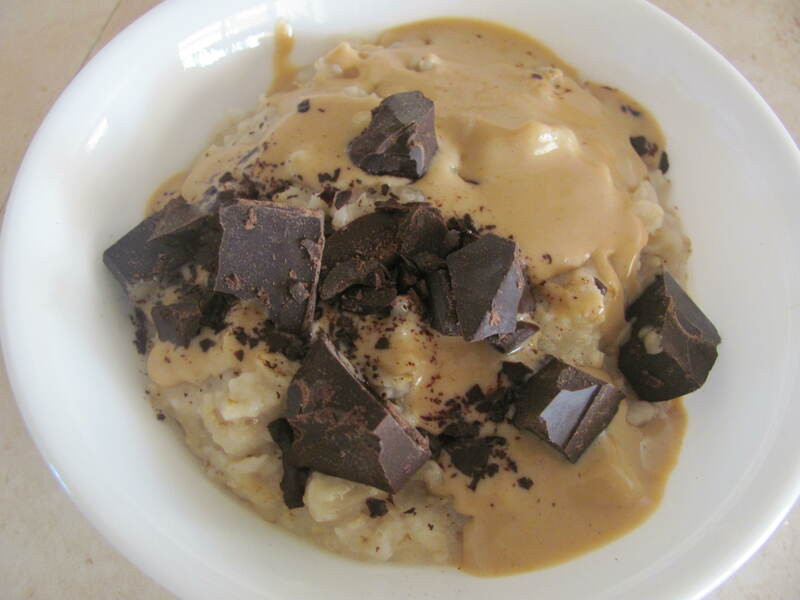 I’ve tried oatmeal with tahini and unsweetened carob chips, but today I tried Heather’s oatmeal with tahini and unsweetened chocolate. It was sooo extremely bitter! Bitter tahini meets bitter unsweetened chocolate! Like whoa. I like the carob version much better! I still managed to eat the whole bowl. Once I got down to the last few bites my tongue was used to the bitterness! Later on in the day I was feeling snacky again. My mom picked me up some dates (and organic spinach, frozen blueberries and feta!) at Sam’s Club and I just could NOT wait to dig in! I just HAD to make a peanut butter stuffed date as seen on Gabriela’s blog. I took the biggest date in the container and removed the pit. Once you remove the pit, you have a perfect little cranny for filling with whatever your heart desires! In my case, 1/2 Tbsp. Smucker’s Creamy Natural peanut butter and unsweetened carob chips! Oh my gosh. So delicious and amazing and SUPER sweet! 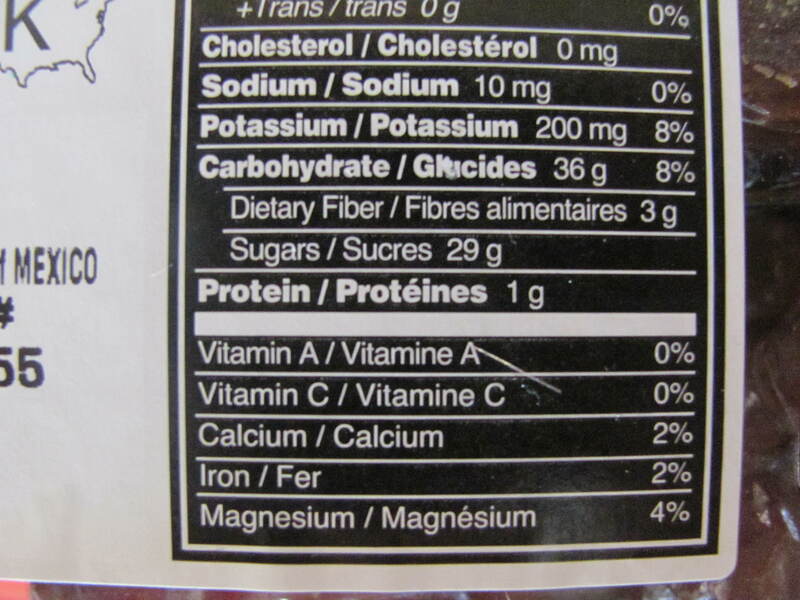 29 grams of sugar…CRAZY! That’s for 2 dates, I only had one. But still, that is a lot! 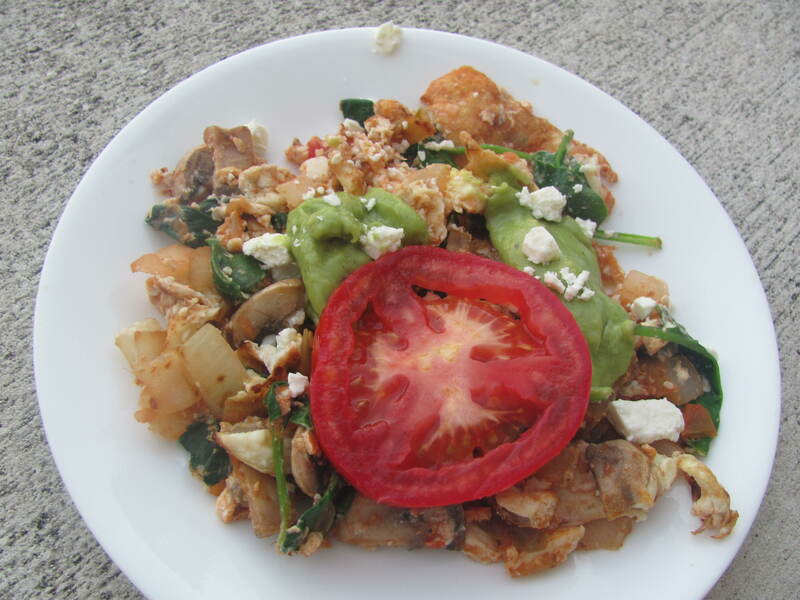 3 egg whites, chopped onion, sliced mushrooms, spinach and salsa topped with guacamole, a little feta and a tomato slice. This was actually going to be an omelet, but I had so many topping and fillings that I wanted, an omelet just wasn’t going to cut it, I had to go scramble! This tasted amazing. So, that’s all I ate today! Counting calories REALLY helped me. If I wasn’t counting my calories for today, I probably would have had like 2-3 more stuffed dates and snacked on more brussels sprouts. I basically eat out of boredom, but when I count calories I always do better because I have a plan and want to stay on track. Will I continue to count calories everyday? Maybe. It seems to really work for me. As long as it doesn’t take up too much time and as long as I don’t eat too little, I say why not? Do you, have you ever counted calories? Why? I like to count calories too! I’m about to hop on the stuffed date thing because we just bought some!! I used to count calories and I found it so helpful. I just got so tired of doing it on a daily basis =/ I mean I realize I kind of take advantage now of my eating habits more (no no!) without counting but I’m hoping to gain control of myself and not rely on counting to be healthy. I mean after doing it for half a year you would get tired of it too haha! My range was always 1200-1600calories 🙂 1200ish if I didn’t workout and it was 1600ish if I did workout lol! i used to count calories but it became obsessive and took over my life! I fee l like i have more freedom when I dont.. but if it works for u now they go for it! Really craving some dates and peanut butter now! I don’t count calories.. don’t mind if others do, it just isn’t my thing! I’ve been wanting to make oat flour bread! You beet me to it-Good! Now I know it works 🙂 I am bookmarking it! 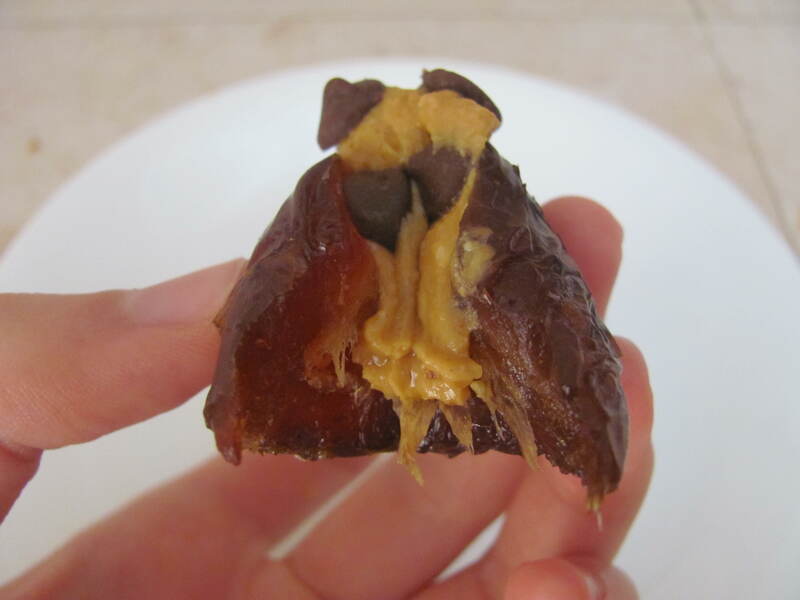 I love dates stuffed with pb! Cream cheese or goat cheese is also tasty! 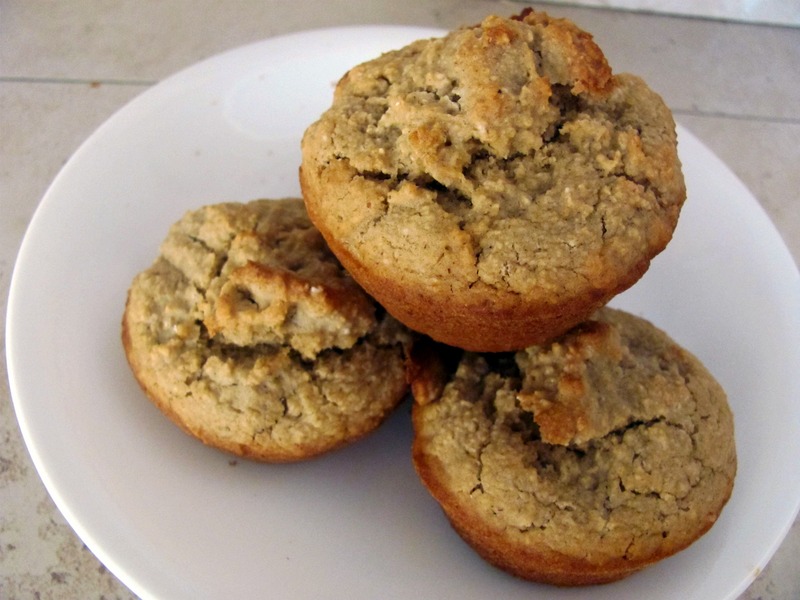 Your oat flour muffins sound perfect and I love that they’re sugar-free! I’ll have to give them a try! I used to count calories, but it didn’t take long for me to become obsessed about it and I always ended up going to bed feeling guilty…and hungry! I try to be mindful of my calories, but I don’t keep track of every morsel. 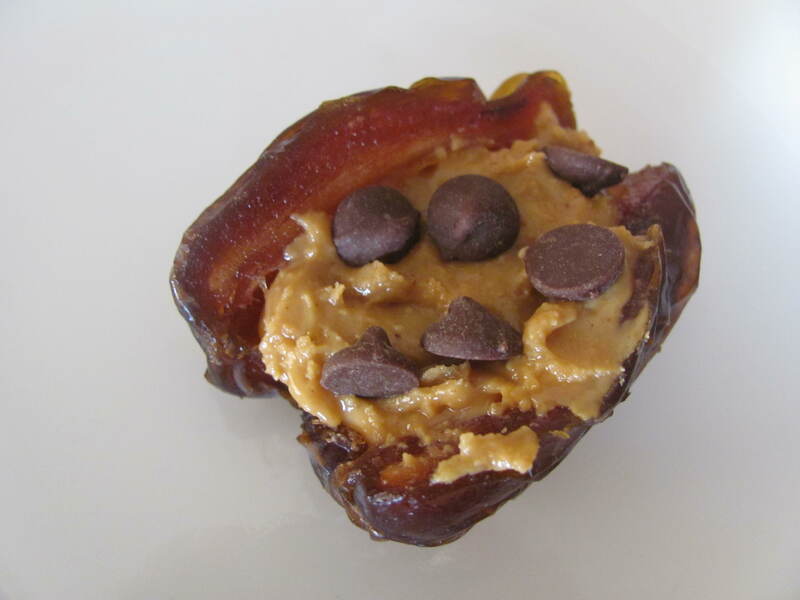 That pb-stuffed date looks awesome, by the way! I say do whatever works for you, girl! If counting calories keeps you mindful and extra alert regarding what you eat, go for it! I’ve never counted calories before. Too much work haha! Awesome job in your workout! I always say do what works well for you. No two bodies are obviously the same and whatever works for you is what works for you. I haven’t counted in a while, but for some people, I know it’s what works. I might do it again, might now. Who knows. Nut butter stuffed dates are really really REALLY good. Enjoy one for me please. I’m dateless. 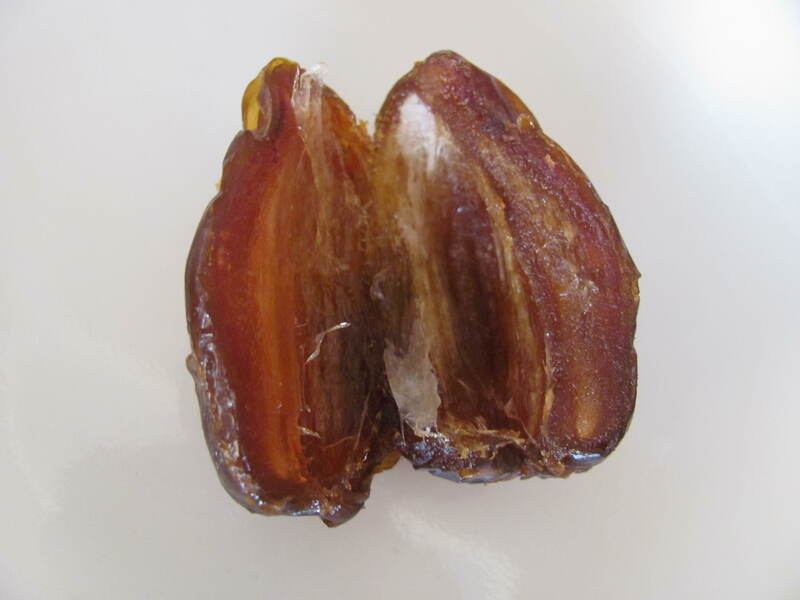 Dates are natures candy! I totally agree. Good to hear! It works for me, too! 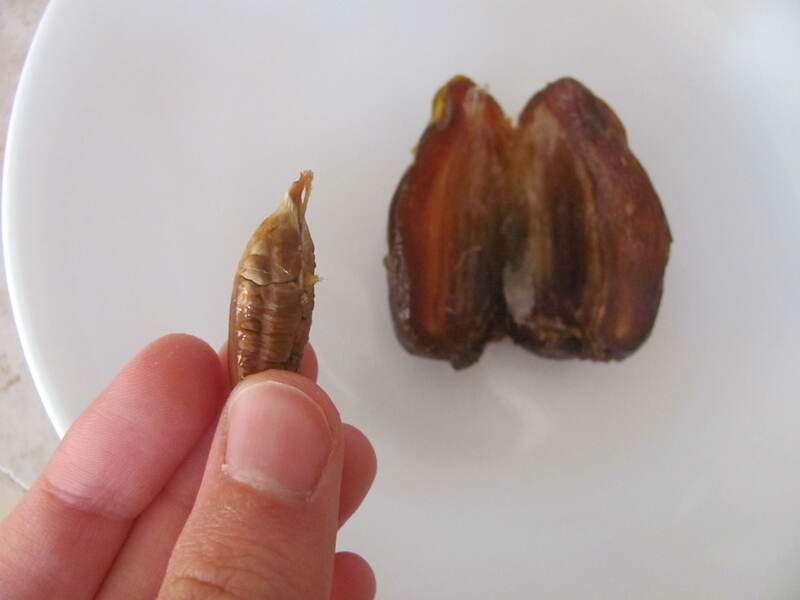 I love stuffed dates! I also love huge egg scrambles, I like eating them over salad. I used to count calories, but I got obsessive and so I’m trying really hard to stop. I’m still learning to listen to my body because I tend to eat less than I should. I definitely don’t feel bad like I used to when I eat a little extra! I use to count calories, but I went to the extreme so I try not to count anymore besides having a rough estimate. I count so I know I am eating enough. 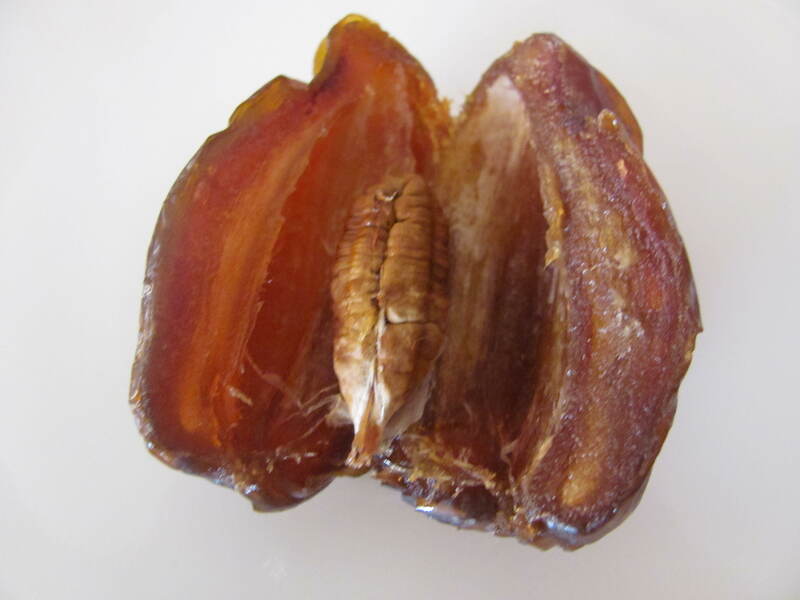 Dates are such a freaking miracle! I eat them just about every day. They are so rich and sweet, perfect snack material right there. Frozen fruit is AMAZING in oats! I honestly do not think that people should be counting calories. I know you hate it when people say that, but there’s a reason behind it. When you count calories, you tend to limit yourself and not actually listen to what your body is truely craving, whether you notice it or not. You will never fully recover unless you stop. It is not normal, and it will not help you in the long run. I think counting calories only works for people who need to gain or loose weight. As long as you are not over eating, you should not be limiting yourself. If you want to have that extra date, go ahead! It will not harm your body! I don’t want to make you upset, but what you are eating right now definitely does not seem like enough. Most teenage girls eat more than that. Being obsessed with eating healthy nad having the healthiest life style you can is anything but healthy. There shouldn’t be so many restrictions around food. I think you should not be counting calories everyday, or at all for that matter, and truely listen to what your body wants, not what you think it wants. No, eating less does not mean that you are eating better. No offense but it’s the truth. I hope you and all others out there soon realize this. I see what you are saying. I really truly do. I agree that counting calories is not natural. I realize that I’ve been eating less. But this is my problem: I have no self control. I am not good at listening to my body. I am not good at stopping after just a few. I overeat. I overeat a lot. When I count my calories it’s easier for me to realize what I am eating. I do not plan on counting calories for the rest of my life, in fact, I have thought about just writing down what I eat, and not adding up every single calorie. I know that eating less doesn’t make me healthier. But trust me, I have eaten my fair share of calories. I have gained about 20 pounds since Christmas due to all the healthy cookies and baked goods I made and by just being plain lazy. I haven’t weighed myself for a few weeks now, and I don’t think I’ll ever weigh myself again because the number would probably depress me. I want to just find my Happy Weight, and fit into my jeans, I don’t want to fret about a number on the scale! Counting calories these last few days was a step for me in remembering that food is fuel and energy. All that extra fuel and energy that I have been eating was unnecessary so my body packed it as fat! I do NOT post everything I eat. There’s not enough time in the day! So you really don’t know how much I am eating. I know that counting calories can become obsessive and restrictive, and I’m determined to not let that happen to me. Today for breakfast I had oat bran with peanut butter and banana. A few hours later I was still hungry so I had a piece of whole wheat bread. I am now feeling hungry, and I know I need some protein so I think I’m going to make eggs! I am NOT depriving myself. I am not obsessed with eating healthy. I love healthy foods because they fill me up and give my body the energy it needs! If I choose to not eat pizza like everybody else, I’m not restricting, I simply don’t like eating pizza from fast food restaurants, I’d rather make my own! (and I have! ).